We supply standard railway fastener like the elastic clip, rail bolt, fish plate, rail shoulder, anchor, spike, screw, dog spike, plastic dowel, pad, washer, nylon insulator, and the locomotive brake block. We can offer samples to our customers for free. In order to ensure all fasteners produced to meet customers' demands, we would make samples according to the design drawings confirmed by our client before mass production. Because we put the quality of our products and our customers first, quality control management is a priority at ZY. 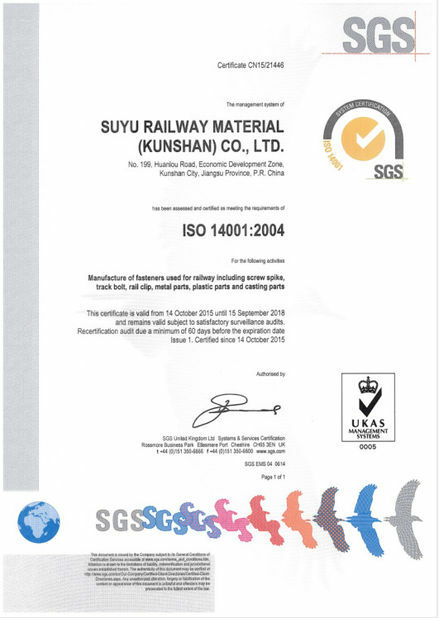 We have been granted the ISO9001-2008 certificate, and have received the production license for our railway products from China's Railway Ministry. Our production process is state of the art, with an advanced mold-processing center, two production lines for rail clips, heat treatment lines, and 20 production lines for railway fasteners. We also have a full line of inspecting equipment. Producing high quality products and providing superior customer service are top priorities at ZY. Therefore, we insist that our products conform to the agreed specifications stated by the buyer. We also ensure that our products are free from manufacturing defects for a period of three years from the date of receipt. Within the warranty period, all products that do not conform to the buyers' specifications or are found to have manufacturing defects are replaced within 60 days of receiving the buyer's written notification of the problem. All our rail fastening products are provided with over three year's warranty. At ZY, we strive to offer the most competitively priced products to our international customers. That is why ZY has long term business relationships with the country's largest steel mills, enabling us to receive the lowest material prices available. ZY's technical team finds the most cost effective production techniques to ensure that production cost is controlled at all levels. To control labor cost, we look for ways to improve employee efficiency and to best utilize their strengths. 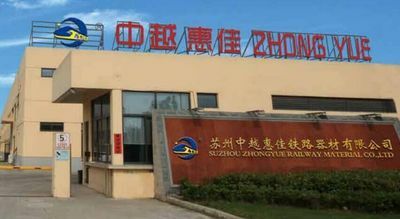 Working with the spirit of perseverance and the pursuit of excellence, and with the goal of providing first-class railway material to the world, we at ZY would like to be your reliable railway fastener supplier. We look forward to building a bright future with you! We can offer free samples to our customers. Before mass production, we make product samples according to the design drawings confirmed by our client, so as to make sure all our railway fasteners produced meet customers' demands. All our rail fastening products are provided with over three year's warranty. The ZY staff is comprised of highly qualified experts, formerly from state railway companies. Our team includes 8 senior engineers, 20 professional technicians, and a group of highly experienced operation workers. We have our own R&D team, an after-sales service team, and a quality assurance team, all of which use the most advanced technology and management practices.